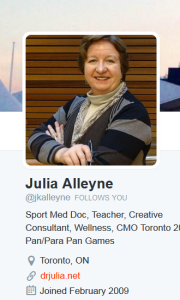 Dr Julia Alleyne (@JKAlleyne) is a specialist sports medicine physician whose experience includes having been Medical Officer for Canada at multiple Olympic Games and CMO at the Pan Pacific Games (2015). She has held numerous leadership posts in the Canadian Academy of Sport & Exercises Medicine (CASEM), a BJSM member society. She combines academic work at the University of Toronto with being a clinician at Toronto Rehabilitation. Worldwide, the incidence of dementia and related cognitive disorders is estimated to affect 44 million people (CDC 2014) The benefits of exercise for people with dementia far outweigh the risks, despite the person’s level of cognitive impairment. The type of exercise best suited to improve cognitive processing is aerobic and resistance training or a consistent active lifestyle. The most common cause of dementia is aging compounded by vascular impairment. Therefore, since exercise reduces the incidence of hypertension, coronary artery disease and strokes, exercise also reduces of vascular aging in the brain. To assess brain anatomy, Colcombe et al (PNAS, 2004) studied MRI scans in older adults who walked 3 x week for 6 months and found significant increases in gray and white matter volumes. BJSM Senior Associate Editor Teresa Liu-Ambrose used functional MRI to examine brain function (Arch Int Med 2010) I in older adults who participated in resistance training twice weekly. She found significant improvement in brain functions which then persisted for at least 12 months after training had stopped. These changes included memory recall, time duration for cognitive response and ability to follow instructions. What about the personality and mood changes that occur with cognitive decline? Behrman et al (Practioner, 2014) took a similar approach extrapolating the known benefits of exercise on adult depression symptoms and studied the effect of exercise on older adults of various ages. They found that with increased activity including walking and dancing, patients with mild to moderate depressive symptoms associated with dementia improved their feelings of self-esteem and mood while decreasing negative distracting thoughts. They compared the gains to pharmacology treatment and exercise was as effective and often reduced the need for medication with potential side effects. In a 2010 meta-analysis conducted by Sofi et al (J. Int Med 2011) the authors reviewed studies that enrolled adults without dementia symptoms and monitored cognitive function versus anatomical presence of disease to see if the risk of cognitive decline changes in exercising adults. 15 prospective studies were found on mid-age adults participating consistently in an active lifestyle. The overall analysis followed over 30,000 subjects for 1-12 years and found that there was a 38% reduced risk of cognitive decline in subjects with high levels of physical activity and 35% reduction risk in low-to-moderate levels of activity compared to sedentary subjects. In my attempt to present balanced research, I did a literature scan of adverse effects on cognitive function in exercising older adults. The result only unearthed a few logical warnings…start low and go slow to avoid musculoskeletal strain, maintain appropriate energy input and ensure supervision and instructions for new training techniques. The main finding was that cognitive function does not worsen with exercise and that is a critical take-home message. In summary, the protective effect of physical activity on cognitive function relates to maintaining good cerebrovascular supply to the brain through blood flow and oxygen as well as via direct endocrine mechanisms. Through the positive effects of exercise on cardiovascular risk reduction, the incidence of associated cerebrovascular events from diabetes, hypertension, obesity and dyslipidemia is greatly reduced and thus reduces disease induced cognitive decline. An active lifestyle also likely protects the brain by stimulating neurotrophins – as their name suggests the factors promote neural growth and survival. Lastly, there is ongoing research suggesting that through exercise there is a reduction in stress related cortisol levels which may also help preserve cognitive function. All science aside, I recall a public campaign years ago that proudly announced the slogan, “Be Smart, Exercise your Heart” … I think the underlying meaning is finally coming of age, no pun intended! Stanley J. Colcombe et al; Cardiovascular Fitness, Cortical Plasticity, and Aging Proceedings of the National Academy of Sciences of the United States of America. Vol. 101, No. 9 (Mar. 2, 2004), pp. 3316-3321. Liu-Ambrose T et al, Resistance training and executive functions: a 12-month randomized controlled trial, Arch Intern Med. 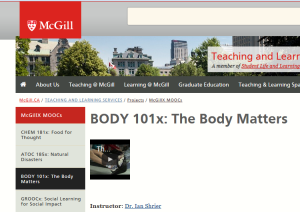 2010 Jan 25;170(2): http://www.ncbi.nlm.nih.gov/pmc/articles/PMC3448565/ (See also http://bjsm.bmj.com/content/43/1/25). 3. Behrman S, Ebmeier KP.Can exercise prevent cognitive decline? Practitioner. 2014 Jan;258(1767):17-21, 2-3.